Browsing through the photo record of Tuesday's Titanic 3D premiere in London, one notices immediately the absence of Leonardo DiCaprio. What gives? 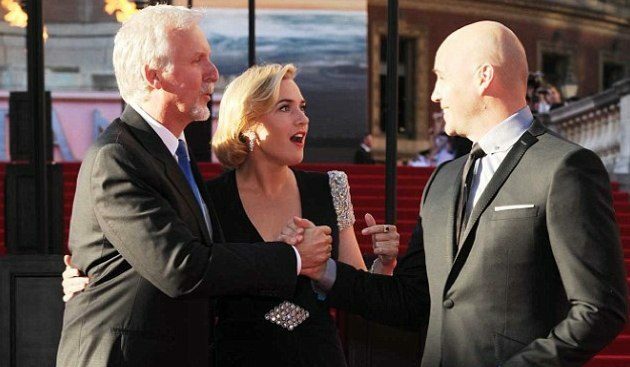 I mean, if Billy Zane can make time, then lord knows Leo should be able to drop in for at least a few snapshots with James Cameron and co-star Kate Winslet. At the very least, he'd better have a good excuse — which, according to Cameron, he did. "I didn't show him the whole film but I showed him 18 minutes of it a few months ago," Cameron continued, "It was a good reunion for us but great to watch his reaction. He couldn't believe it. He said to me, 'I'm such a young punk. Look at me.' He was practically crawling under the seat. It was a good moment." "I'm not going to look. I'll be in the bar by that point or on the floor. [...] I haven't seen the whole film in a very long time, I've seen little pieces of it, but it's a whole different me and we look much younger and our acting was different, hopefully not as good as now." Never let go, babe. Now someone tell us where Kathy Bates was. James Cameron is on his FIFTH wife?? That's the real headline. I have never imagined that there are so fabulous blogs. Really when someone doesn’t understand then its up to other visitors that they will help, so here it occurs.